A crash involving a high-speed train at a station in the Turkish capital Ankara has killed at least nine people and injured 47, Turkey's transport minister has said. Images from the scene showed emergency services working to rescue people from badly damaged carriages. Reports quoting local officials said the high-speed train had collided with another train, then an overpass. 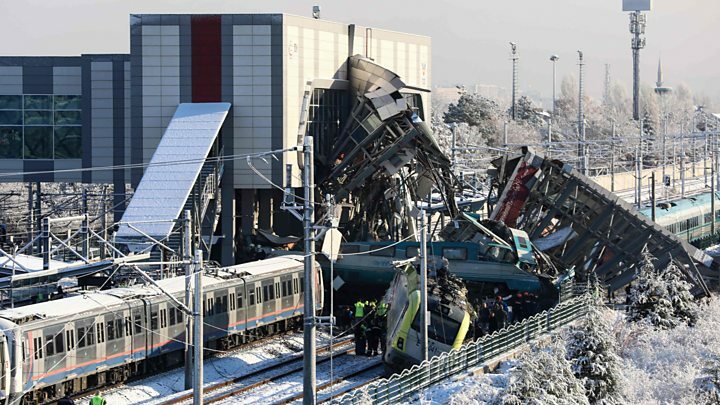 At a news conference, Ankara governor Vasip Sahin said the train was travelling from Ankara to the southern city of Konya when it collided with a locomotive inspecting tracks at the station. Three train drivers were among nine people killed in the crash, according to Turkish Transport Minister Cahit Turhan. Turkey's state-funded Anadolu Agency reports that 206 passengers were on board the train. Three of the injured are said to be in a serious condition. Search and rescue efforts are still under way. The Ankara state prosecutor's office says it has launched an official investigation into the cause of the crash. In a tweet (in Turkish), the Union of Chambers of Turkish Engineers and Architects quoted its Chairman Yunus Yener as saying that "signalling problems" had been flagged on the line "for some time". It added: "The accident is murder!" In July, 24 people were killed in Turkey when a train travelling from the north-western town of Kapikule en route to Istanbul derailed.